With less than seven days remaining the bidding for a major piece of poker history is heating up. 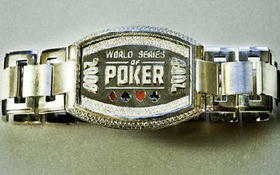 The 2008 World Series of Poker bracelet Peter Eastgate was awarded for winning the WSOP Main Event is currently up for sale on EBay with the high bid at $45,100 at the moment – the listing has garnered over 42,500 looks up to this point as well. Eastgate officially stepped away from poker just before the 2010 WSOP and was later released from his PokerStars contract –it would seem that Eastgate is looking to put poker completely behind him. It will be interesting to see how high the bidding will go for the 168g of White Gold with 291 diamonds, which was hand-made by Corum –the original price-tag of the bracelet was in the neighborhood of £10,000. Obviously the historical significance makes the bracelet more valuable, and the charity-factor will likely drive up the bidding as well. So, if you’d like to own a piece of World Series of Poker history the current bid amount is $45,200, but the good news is that shipping is free for this auction! This entry was posted on Friday, November 19th, 2010 at 5:56 am and is filed under Poker Industry News. You can follow any responses to this entry through the RSS 2.0 feed. You can leave a response, or trackback from your own site.